Database Systems Corp. (DSC) is a recognized leader in providing state-of-the-art computer software and telecommunications products and services. These products include automatic phone message delivery systems. DSC provides a wide range of voice broadcast services at our own managed call centers. These services are ideally suited for schools and educational institutions that need to communicate rapidly with parents, students, faculty and the community at large. Maintaining contact with members of a school is now a much easier task with these advanced communications systems and services. School announcements and school alerts such as school closings due to inclement weather, meetings or special events can be automatically broadcast to all or part of your community with the same, consistent message using our automatic message broadcasting systems. Absentee students can now be reported immediately to parents or guardians using our automated phone systems. This can be a vital service not only to report absentees, but to notify parents of missing children in a more timely manner. School calls can be sent immediately to all of your students and staff so that important events such as weather related school closings can be broadcast to everyone at once. Simply record your announcement online or using or 800 phone service. Next specify the list of individuals who are to receive this message. This list can be built online and can be stored for later use. Then simply push the "Start" button on our online administrative screen. Contact DSC or visit our School Calls website to learn more about our school announcement systems and outsourcing services. 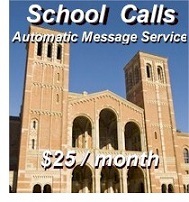 DSC now lets you manage your school calling campaigns using your smartphone. The following easy to use functions are available to smartphone users. The smartphone application now lets you manage any number of school calls using simple phone commands. Contact DSC to learn more about this simple way to control your school calling campaigns and to obtain a copy of this smartphone application. LACCD uses our automatic school messaging and announcement phone service to contact former students and notify them of upcoming school registration. Calls are also made to students regarding upcoming school events. DSC can provide your organization with a complete, turnkey call announcement phone system. If you need to get a calling campaign started immediately, we can provide your organization call announcement outsourcing services at our multiple facilities. These services are ideal for community or customer notifications. Contact DSC or visit our School Calls website for a FREE analysis and quote and to learn more about our school announcement services.